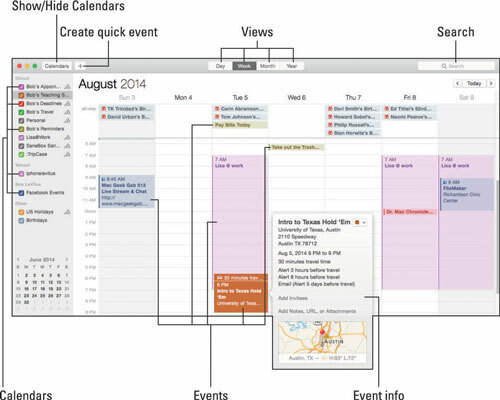 Calendar is a wonderful program that provides multiple appointment calendars with alerts. More precisely, you can have multiple color-coded calendars; several types of visual, audible, and emailed alerts; repeating events; and more. You can publish your calendar(s) on the web for others to view (which requires an iCloud account or other WebDAV server), and you can subscribe to calendars published by other Calendar users. You can view your calendar by the day, week, month, or year. The figure shows a weekly view. To select a view, click the Day, Week, Month, or Year button at the top. To move back or forward, click the arrow buttons on either side of the Today button (upper right). You see the previous or next week in Week view, yesterday or tomorrow in day view, and so on. To go to today’s date, click the Today button. To add a new calendar, click the New Calendar (+) button. You can find all these items, most of which have shortcuts, in the Calendar application’s View menu. This menu offers almost total control of what you see and how you navigate. If you want to master Calendar, it would behoove you to spend some time experimenting with these views and with their navigation commands and options. You can see a list of calendars in the top-left corner: Bob’s Appointments, Bob’s Teaching Schedule, Bob’s Deadlines, Bob’s Travel, and so on. 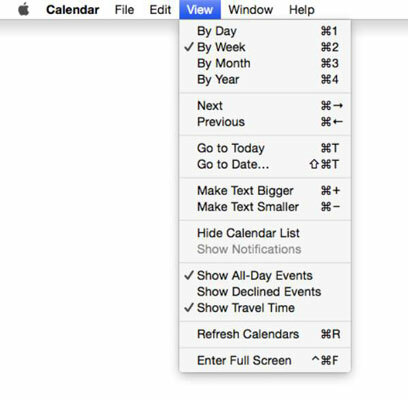 The check boxes turn the visibility of a calendar on (checked) and off (unchecked). Choose File→New Calendar→iCloud or other accounts you enabled in the Internet Accounts System Preference pane. A new calendar named Untitled is created and added to the appropriate calendar list. To give your calendar a name, select Untitled and type a new name. (Optional) To color-code the entries for this calendar, first select the calendar (click it); choose Edit→Get Info or press Command+I; and then select a color by clicking and holding the color swatch. Other is the coolest choice because it lets you select from thousands of colors — including the lovely shade of fuchsia used for Bob’s Appointments calendar. (Optional) Before you click OK to dismiss the Get Info sheet, feel free to add a short description of your calendar in the space provided. Now, events created while this calendar is selected in the Calendar list on the left will appear in the appropriate color on the calendar. If you have an iCloud account, you can publish your calendars and invite others to subscribe to them by right- or Control-clicking the iCloud calendar in the list and choosing Share Calendar. The invitees receive an email asking them to subscribe to your calendar. To delete a calendar, select it in the list and choose Edit→Delete or press Command+Delete. If the calendar has events on it, you see an alert box asking whether you’re sure you want to delete that calendar; if not, the calendar will be deleted as soon as you choose Edit→Delete or press Command+Delete. When you delete a calendar, all the events and reminder items in that calendar are also deleted. Although you can undo a deleted calendar (choose Edit→Undo or press Command+Z), you must do so before you quit Calendar. If you quit Calendar without undoing a calendar deletion, everything on that calendar (or calendars) will be gone forever (unless, of course, you have Time Machine or another backup). If you sync your calendars with iCloud and/or other cloud-based services, the calendar will be deleted from all of your devices.